The first volume of The Theatre Machine is a ”hands-on” text for teaching virtually all of the fundamentals of performance over a relatively brief, challenging, and entertaining span of time. The text contains fifty individual lessons, which may be integrated with other classroom materials, or used exclusively, one lesson per day, over a ten-week period. This text encompasses virtually all the major areas of training, including: Relaxation & Concentration, Acting, Actions, & Pantomime, Improvisations, Theatre Games, Monologues, and many others. Read more...You’ll quickly discover that when you have a Theatre Machine in your class it will turn out exciting projects, day after day. 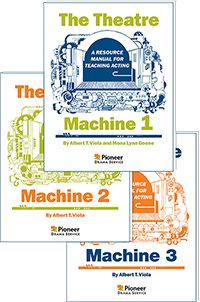 The Theatre Machine II: The outstanding lesson plan format of the original text has been extended to this second volume with 50 brand-new lessons. Introducing the concept of the Seven W’s in a series of sequential lesson plans, this volume emphasizes moment-to-moment reality to make a scene believable. With many fresh theatre games and improvisations, the text also includes a section on blocking. This excellent teaching tool is geared to making it simple for you to challenge your class, whether you use it exclusively or as a supplement with other classroom materials. The Theatre Machine III: The third book in the series clarifies the most influential acting system in the world through 22 sequential lessons. Based on the Stanislavski system - also known as Method acting - along with techniques enhanced by his protégé, Eugene Vakhtangov, this text reinforces and builds on concepts from the first two books with a more in-depth approach to scene study. Organized under the following sections: Movement and Motivation, Getting into Character, Special Tools and Techniques, and Scene Study: Breaking It Down, the book is filled with rare and never-before-published techniques and exercises. These teaching tools address action/tasks, intentions, objects, goals, beats, inner monologue/stream of consciousness, observation, emotional and sense memory, animals, muscular tension, dream rehearsals, monologues, and classic acting scenes. Practice excerpts include classic scenes from the great playwrights, including Chekhov, O. Henry, Ibsen, O’Neill, Wilde, Glaspell, Masters, Baum, and others as well as contemporary original scenes. Depending on the class, this outstanding teaching resource could serve as the basis for a term’s learning or even a whole year’s worth, if done in depth. At last! Here’s a student-friendly, teacher-friendly workbook with study units for a full semester or year. This is a ten-chapter, step-by-step handbook to guide theater actors through the acting process from the moment they are first cast in a role until the final curtain comes down.